Makes it easy to work with epoch timestamps! This is a very simple workflow that uses the system's Python along with the Alfred Workflow library, to easily access the current UNIX epoch timestamp, or convert an existing timestamp. 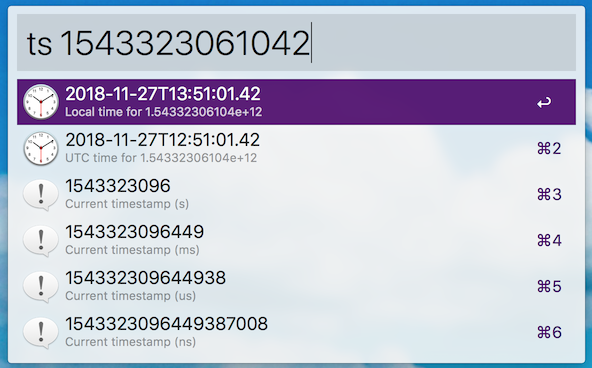 It guesses whether the timestamp is in seconds/milliseconds/microseconds/nanoseconds and displays the human-readable time for both the Local and UTC timezones. It can find the value to convert in your clipboard and works both ways: you can also provide the human-readable time and get an epoch timestamp back.